Three bands from two Nordic and very cold countries – perfect mix for The Arctic Circle Alliance. 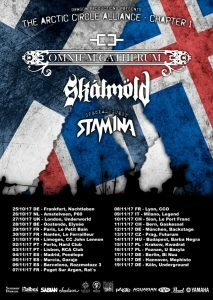 When bands from Finland (OMNIUM GATHERUM, STAM1NA) and Iceland (SKALMÖLD) tour together, there’s a cool breeze in the air. Both countries are said to be cold and during this time of the year, when days are getting shorter, I can understand pretty good that those people want to leave their countries and go on tour. In Finland, there are only very few hours of sun, now, and in countries like France, Spain and Portugal, they’ll be able to catch many more and to enjoy the ‘warmth’ (wouldn’t wonder if they run around in shorts and t-shirts…). But enough about clichés! OMNIUM GATHERUM is a great live band and everybody who is in melodic death metal will fall in love with them right from the beginning. That’s what happened to me when I listened to their album “New World Shadows” back in 2011. Even the very old outputs “Steal the light” and “Spirits and August light” are nothing the band would have to claim as their first steps. In 2016, they released “Grey heavens” and since then, they had some time and opportunities to practice the new songs. Seeing the new songs on stage will be a blast for sure! SKALMÖLD also come around with a not-so-new-anymore album called “Vögguvísur Yggdrasils” (damn, yes, I copy and pasted that name!). The band was found in 2009 and became famous very quickly. They put a lot of effort and love for the detail into their music, which is influenced by their countries very own traditions. You can, of course, also hear that in the lyrics. 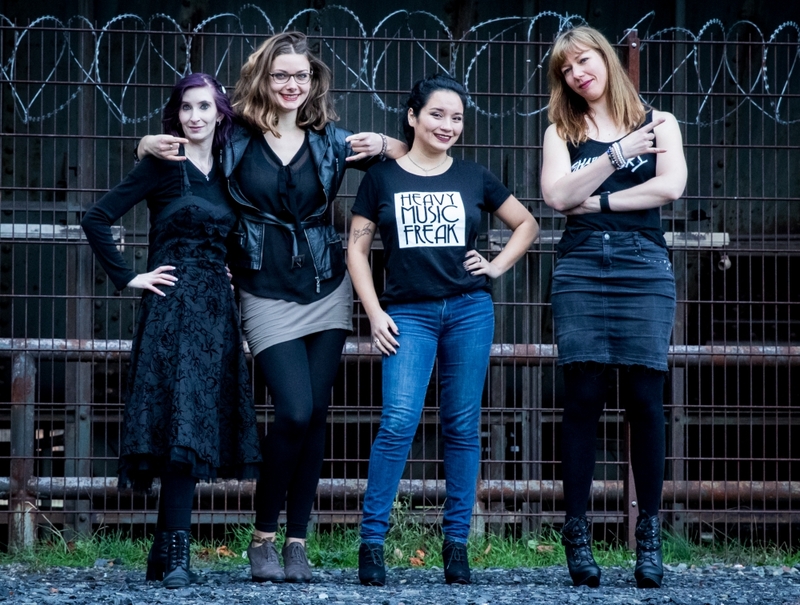 Musically, SKALMÖLD play a mixture of death and thrash metal – some people describe it as battle metal, but I’m not a fan of pseudo genres that tell nothing about the music. Last but definetly not least, STAM1NA will tour with them. The band celebrated it’s 20th anniversary last year with the output “Elokuutio” (copy and paste for the win!). Most of their songs are in Finnish language and it somehow fits their trash metal pretty well! The main reason for their success, maybe. I have the in mind as a really technical band and since Finnish sounds kind of hard to me, it would support the rhythm like in a good death metal band. 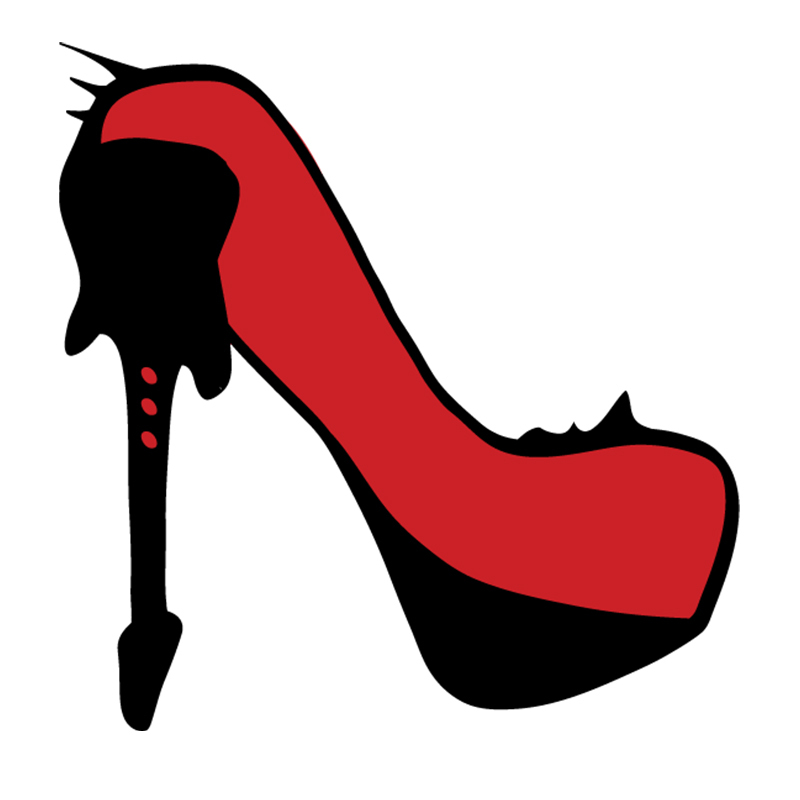 So whoever loves heavy music and an exotic touch, come and see this package on tour! 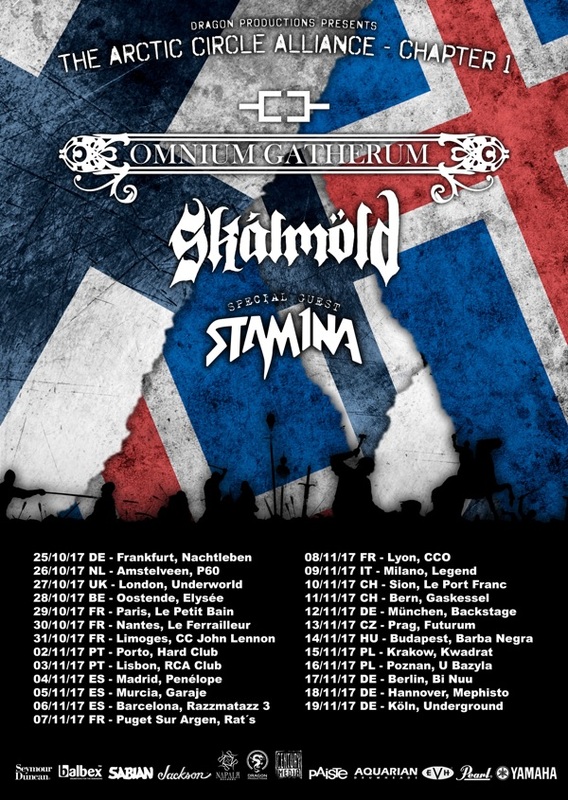 There is a “chapter 1” written in the tour title on the poster, so there might be a chance to see at least OMNIUM GATHERUM and SKALMÖLD touring together again. Would be a great opportunity for those who won’t be able to see them this time. Now prepare your horns! We hope to see many of you on the gig in Cologne (Köln).